IT caught up with urban designer Ron Fleming at a recent APA symposium on green planning. We spoke with him about the subject of his latest book The Art of Placemaking, which discusses the importance of public art in creating meaningful destinations and homes. What is the art of placemaking? Placemaking is a way of thinking about urban design to maximize a people’s connection to the history, land, flora, and fauna of where they are from. It’s a way to anchor people to their locale. It makes people care about where they are from. It gives them a sense of proprietorship and belonging. It creates respect and decreases vandalism. The Piestewa Freeway in Phoenix, Arizona (formerly the Squaw Peak Parkway) is a great example. 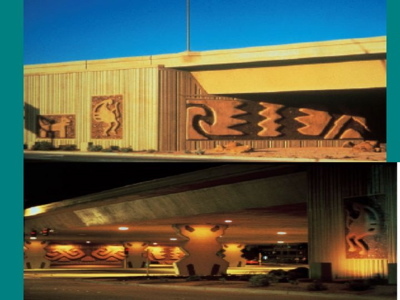 The artist Marilyn Zwak took several underpasses of highway intersections and transformed them into an iconography of the early peoples who inhabited the Phoenix Valley. How did this project affect the community? In my opinion, it really helped mend the community. Initially, residents were really annoyed by the highway because it slashed through neighborhoods. They were also annoyed by the amount of money that was being spent on other works of art that had nothing to do with the place and people. The people were saying, ‘Why are we spending all this money for abstract items that we know nothing about?’ They came really close to abolishing the arts council because they believed this was an abuse of funds. But Marilyn’s piece of work involved a wider selection of the community—local engineers, neighborhood kids—and it connected people to their history and self. When it comes to character and authenticity, it seems there’s an enormous lack of thought that goes into development in this country, which is probably the result of the “bigger is better” syndrome. What needs to happen to change that? Artists really need to get involved early on in the development process and work in teams with engineers, builders, preservationists, even tourism agencies, to create a strategy for building narrative about place into the built environment. Has there been support for this type of collaboration on a state and city level? In some places, like Seattle, there is city and county support. Seattle is very sophisticated and has a really mature arts administration. They are using artists as planners in major systems like water treatment facilities, highways, shorelines, etc. They use artists as planners not just implementers of individual projects. How does placemaking fit into the larger sustainability movement? Sustainability has to be about meaning as well as resource allocation. The techniques of placemaking can be part of a larger story of green design and sustainable design. Building stories into a place are important if we're going to change the way the country thinks about its resources.